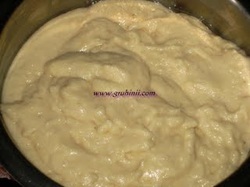 Beat curd and make it smooth. To it add green chilly ginger paste and salt and mix well. Heat 1 table spoon oil in a pan, add rai, jeera, urad dal and hing to it. When rai starts spluttering add curry leaves and fry for few sec and add the thadka to the beaten curds. Heat sufficient oil in a pan for deep fry. 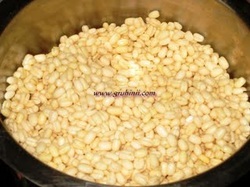 Now take a small ball of grounded urad dal and place it on a plastic sheet. (apply water if necessary to the plastic sheet) Make small circle and make a hole in the middle with your finger. 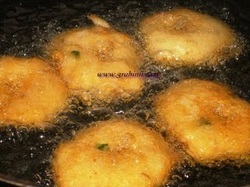 Now carefully drop the vada in the oil. In the same manner you can make remaining vadas. Fry until golden color. Drain and drop them in the Curd mixture. Soak them for 20 to 30 mins. Refrigerate and serve them chilled. 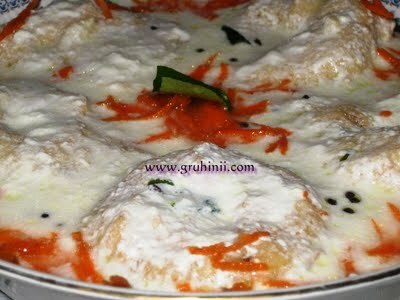 Yummy Aavadalu/Dahi wada are ready..........enjoy......They are also called as Peruguvadalu in Andhra and Dahi wada in North India.